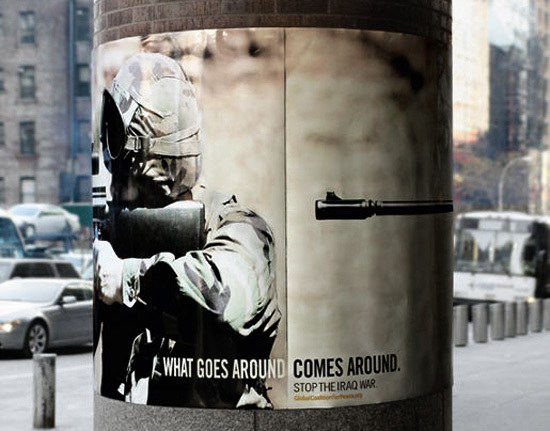 The Global Coalition for Peace wraps its convictions around telephone poles and street lamps with "What Goes Around Comes Around." Each piece features soldiers whose weapons stretch so far around the medium that the barrels ultimately aim back at the bearers. "Stop the Iraq War," the prints proclaim. NICE. Ironic how easily you could substitute an image of Hussein or Bin Laden for the American soldier. What's your stance on Afganistan?